Get ready to hate yourself for buying that expensive beaded wedding dress belt, because I’m going to show you how to make one for around $20! And if you haven’t bought one, yet… then you’re in luck! pant hook and eye clasp (Joann Fabrics $2.99) ps. 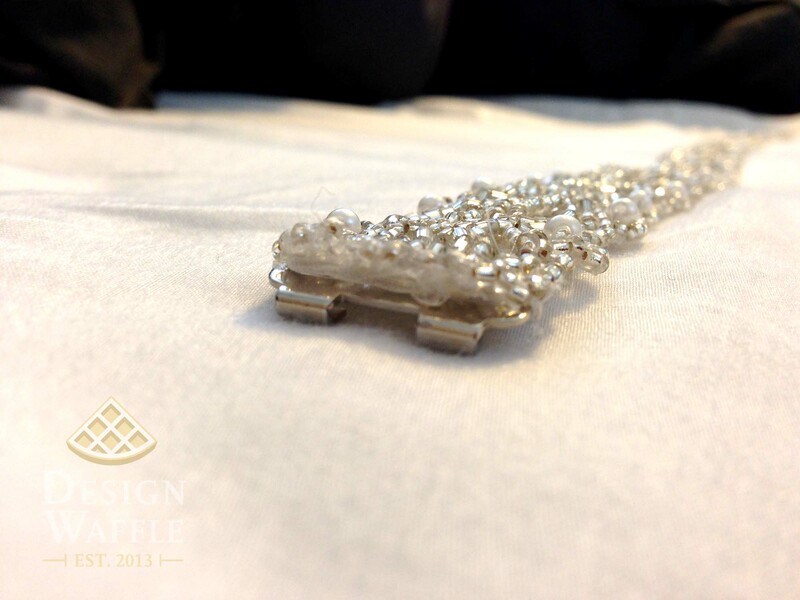 I was just made aware that this clasp was meant for pants… oops. Oh well, it worked great! Tip: Measure! Measure! Measure! 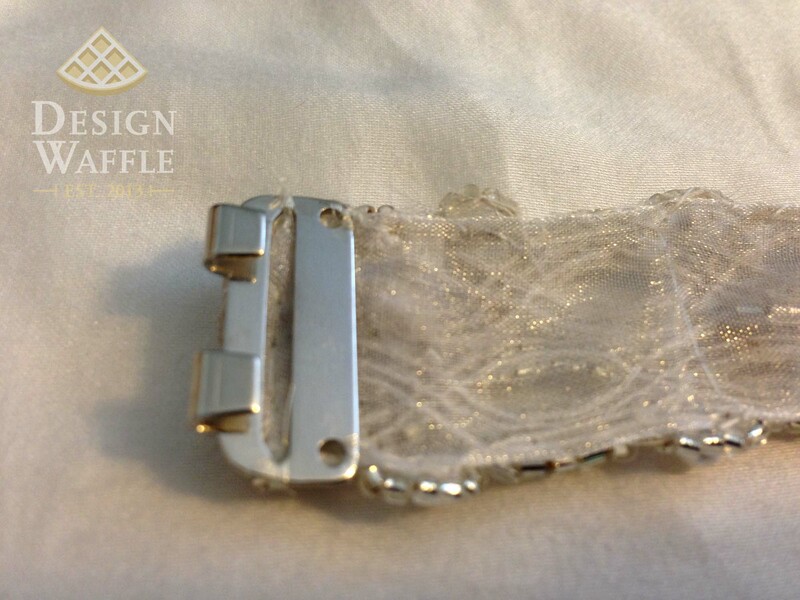 You wouldn’t want to spend all this time making a custom belt that didn’t fit, would you? I tried mine on a dozen times throughout this process to be positively sure that it was the correct size. 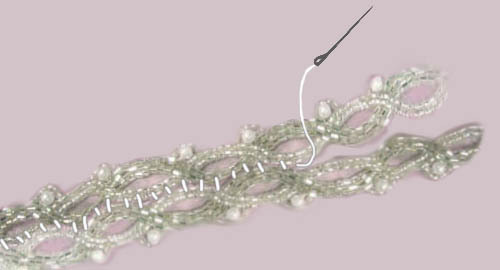 To start, I bought two lengths of beaded trim from Gloryshouse.com that were about an inch longer than the desired belt length/diameter. Below is the exact trim I used. I actually purchased scrap pieces so I ended up paying about $12 in total for the trim. Since this trim was 3/4″ wide, I sewed (by hand) the two pieces together to make a belt that was 1.5″ wide. You could sew on a third piece if you want it to be even wider. I used a whip stitch, and with the invisible thread, you won’t be able to see any of the stitches, even if you’re a sloppy sewer. And my lovely photoshop skills (no judging, I did this quickly!) of how to sew the two pieces of trim together. (If only I knew back then that I would be blogging about all this stuff… then I could have taken an actual photo… darn.) Keep in mind that you are using invisible thread, so you won’t see any of the stitches, promise. I bought sheer ribbon that was 1.5″ wide since my belt was the same width. I whip stitched it (by hand) all the way around the sides (yes, this took quite a while to do). 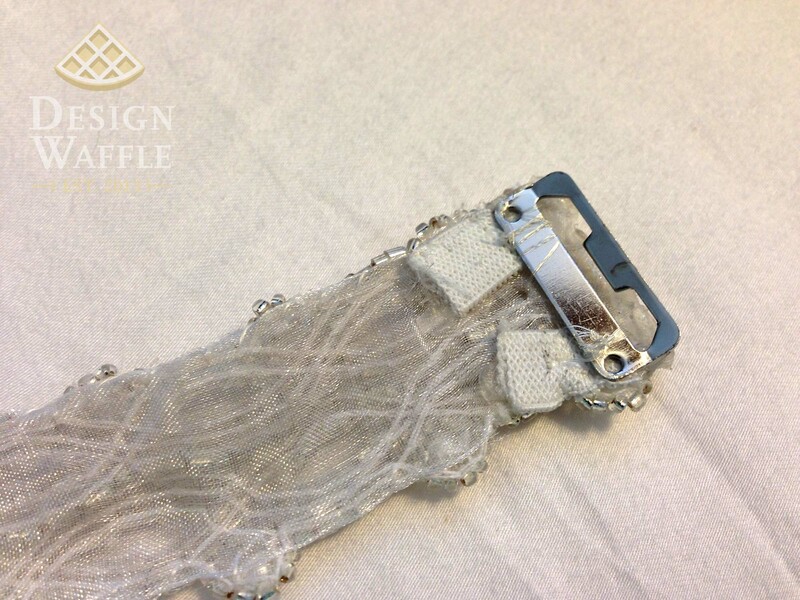 Don’t worry about the curves of the belt, the ribbon will conform around it as you sew since it’s so flexible. Then I attached the first clasp by sewing it. I usually get a little carried away when I sew on clasps and buttons. They’re most likely strong enough to withstand a war. 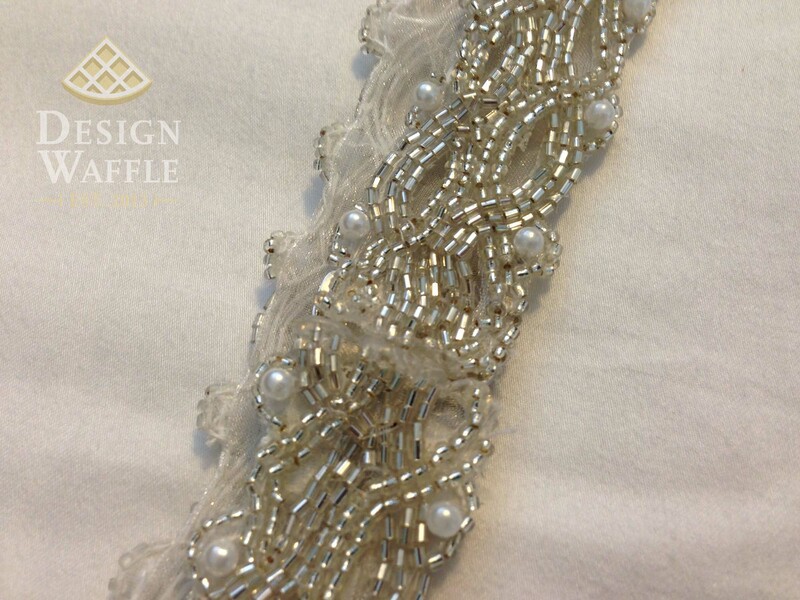 If you really wanted, you could have sewn the beaded trim onto an extra long piece of ribbon and forgo the clasps altogether, leaving long lengths of ribbon on each side of the belt for tying. 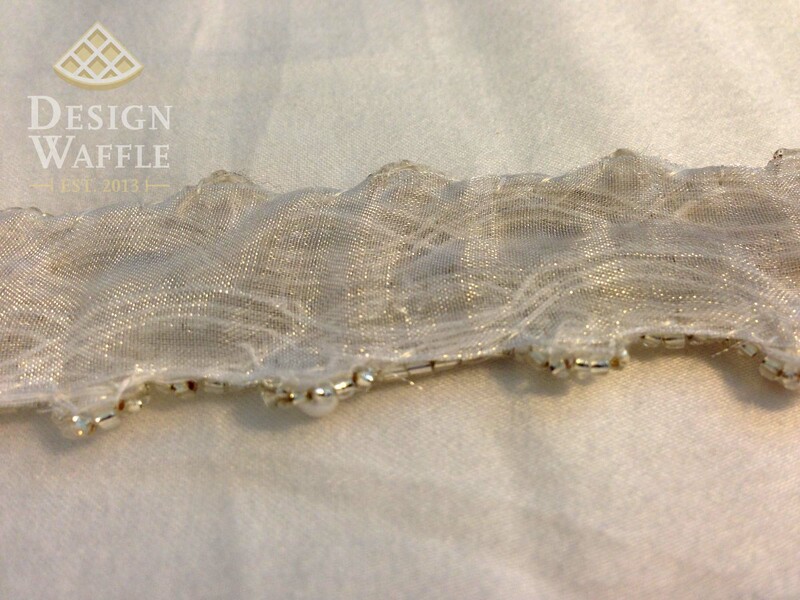 This would make the belt easily adjustable and I suppose more like a wedding dress sash. I wanted a custom, made-for-me look so I opted to use the clasps, obviously. For the other clasp, I first sewed it to the elastic, then I sewed the elastic to the belt. I did this so that it would have a little bit of give when clipping the two clasps together. 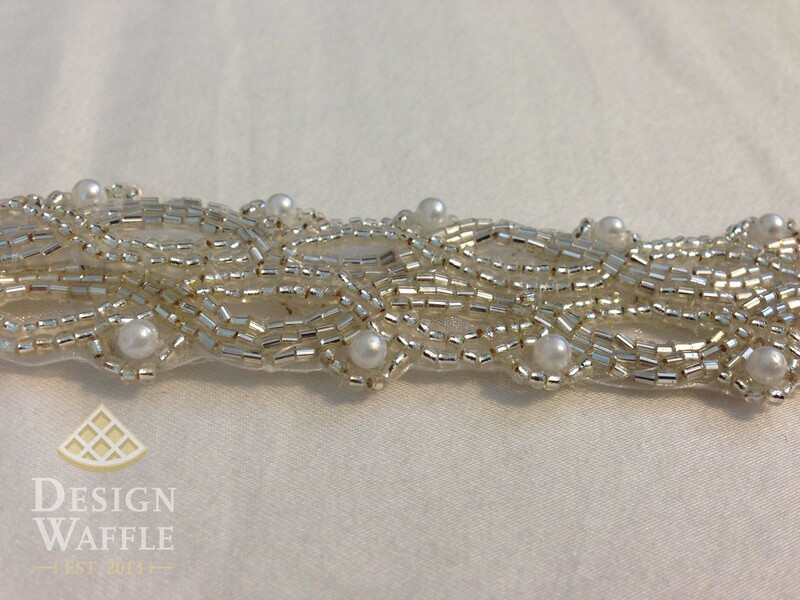 Since the beaded trim is unfinished on the ends, it will continue to unravel if you don’t finish them off, meaning you’ll lose all your beautiful beading and then eventually the clasp will come off. Believe it or not, I used my trusty hot glue gun for this part. I know, probably not the most professional way, but it’s clear and blended really well with the color of beading in my belt. You probably wouldn’t have known unless I told you it was hot glue. It also held really well. Here’s a close up of the glued end. Totally fooled a lot of people into thinking this belt was expensive. It was so ridiculously easy. You really should give it a shot. This is what I call the “beauty shot”. I LOVED this belt. I would wear it every day if I knew people wouldn’t call me out on it. It’s definitely a memorable accessory. 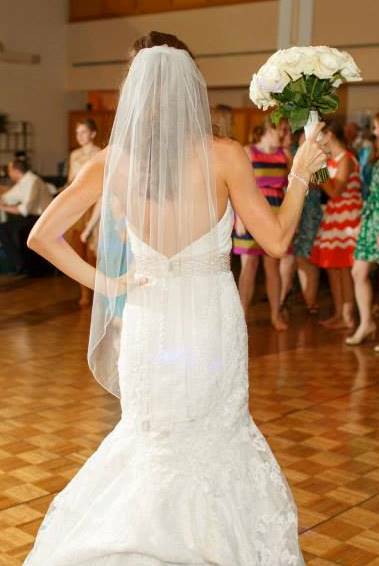 If you’re wondering the designer of my dress, it’s Casablanca style 2043 from the Fall 2011 collection. There isn’t a direct link for it, but you can scroll through to find it. My gown came with a belt, which I thought looked funny and it actually wasn’t the same color as the dress anyway. Did I mention this belt also looks great paired with casual clothing? Why am I holding cat dishes you ask? 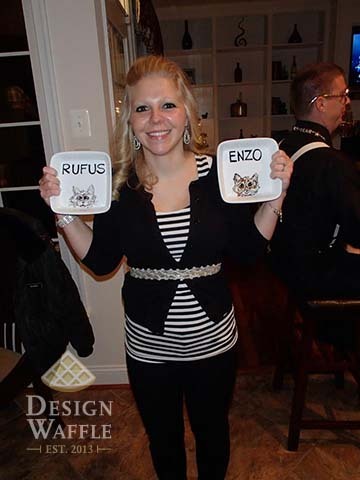 Well I think the real question is, why shouldn’t I be holding these cat dishes? They’re adorable. Although, I can’t take credit for them… they belong to a friend (who made them!). Oh hey, guess what? I took in those pants in 3 different spots because they were 3 sizes too big. I suppose I should post how I did it. Check back soon and I’ll tell you all about it. I always love hearing when my readers attempt my projects and recently I received some photos from Theresa of her DIY belt. She did three rows of beading instead of the two I did. Her belt and dress are absolutely beautiful! 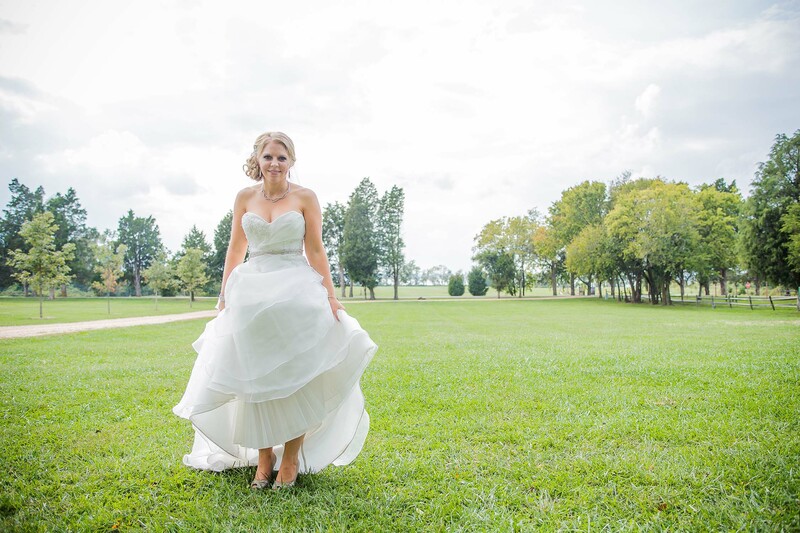 Thank you for sharing Theresa and congrats on your wedding! 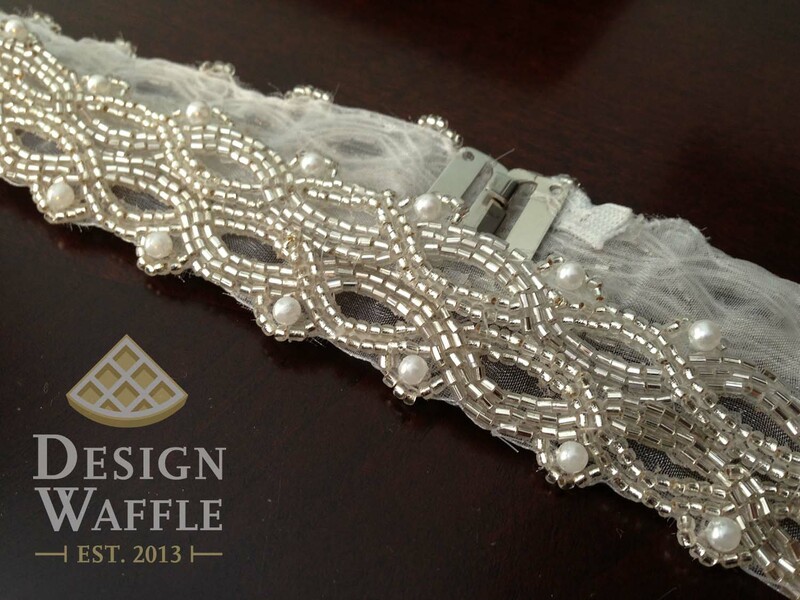 This entry was posted in Wedding and tagged beaded, belt, Design Waffle, DIY, dress, gown, sash, trim, wedding. Bookmark the permalink. I didn’t even realize you used two separate pieces of beading and sewed them together! 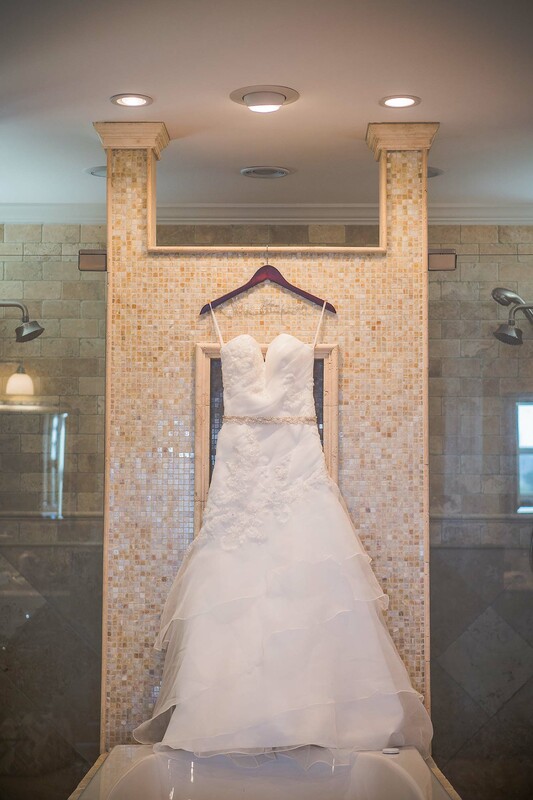 That belt was awesome and added just the right touch of glam to your dress. Thanks Lindsay! The trendy thing now is to have a really elaborate, vintage style sash with flowers and beading. They were beautiful, yet not the right look for my dress. 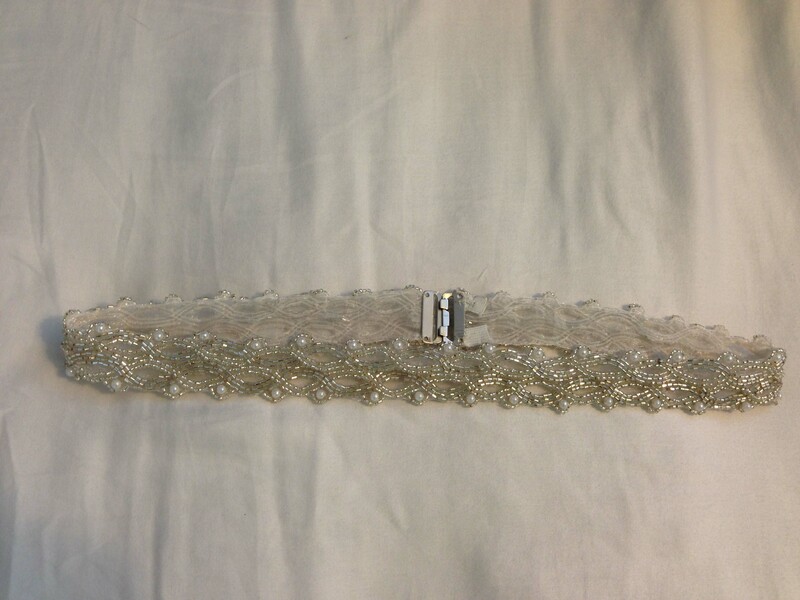 So instead of beating myself up over the price… or the women at the bridal boutiques, over a belt that still wasn’t the right look anyway, I made one to match my dress. I had no clue what I was doing but figured I didn’t have much invested in the project if it failed. Luckily it turned out just as I was hoping. Just finished making my bridal belt thanks to your instructions! Great tip about the hot glue and the bit of elastic (that’s going to come in handy when breathing!). Just saved myself oh so much money by doing this, myself. Can’t wait to try it on with my dress! Theresa, I’m so glad it worked out for you. I’d love to see a picture if you have one! I just received my wedding photos from my photographer but I’m not sure how to post one, here. 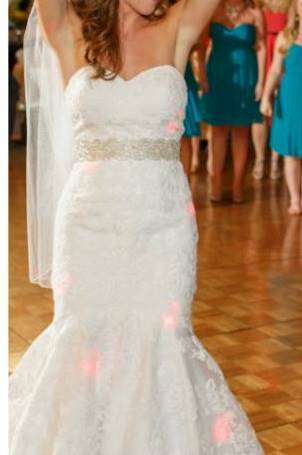 My DIY belt looked great with my gown, especially since the beading goes all the way around. A word of advice, though; make sure to sew the clasp “strong enough to withstand a war”. My belt popped off right before I walked down the aisle!! Luckily, someone pinned it back on with a corsage pin and I was able to get through the ceremony. Afterwards, I used a little travel sewing kit to fix it. I know that sounds crazy but it all worked out and I still say it was worth it! Just make sure you sew that clasp on tight the first time! Wish I had known about Gloryshouse when I bought my belt! Unfortunately, I did have to shell out $200+ for my belt, but it was so beautiful! ~M. 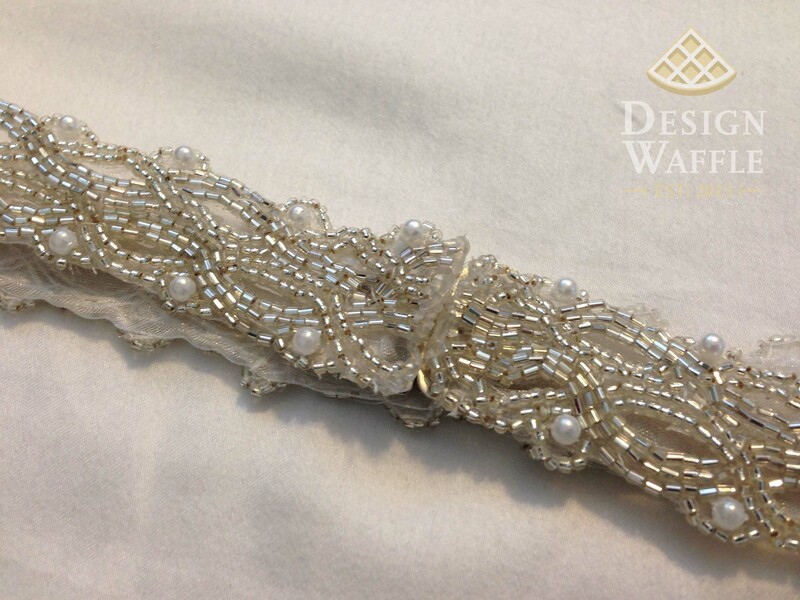 I love this belt- were did you find the beaded trim? Hi! Thank you for posting this. I was getting so sick of how expensive all the sashes were on etsy. I have one question: do you think this work will work if the beaded trim is not 1.5″? Say it’s only 3/4″? 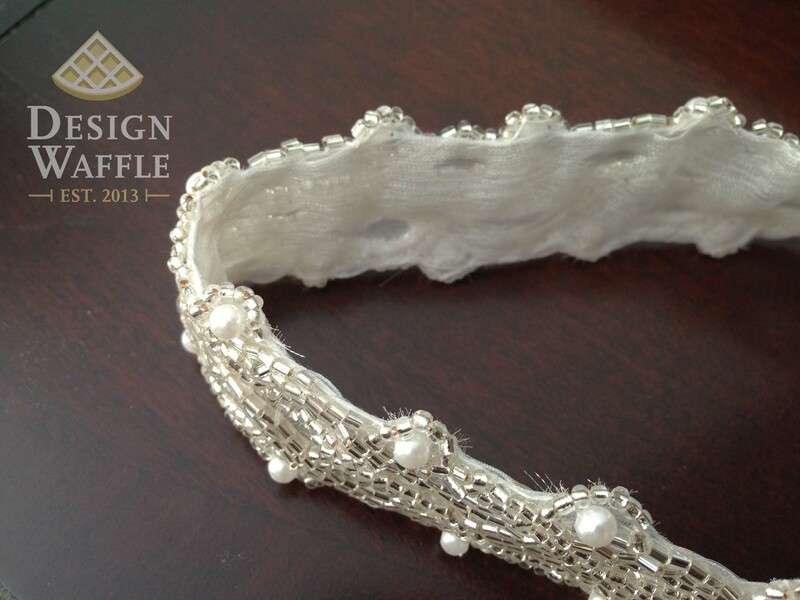 I’m not sure if it’s possible to cut the sheer ribbon and still work with it. You could buy a narrower ribbon, then you wouldn’t have to trim it. The ribbon would fray and fall apart if you trimmed it along the sides instead of just the ends. Good luck with your project! Hi! Thanks so much for the tutorial — I about fell to the floor when I saw what these were retailing at! 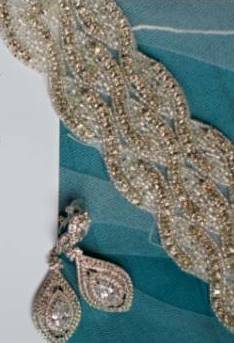 I see the website where you purchased your beaded trim from, but I’m wondering what is the name of the style? I love the particular beaded trim you used and can’t seem to find it. Thanks. Thanks for your tutorial and suggestions! I just finished making my own belt and it turned out fantastic! Awesome! I’d love to see photos! Thanks so much for this – I’ve been trying to find good directions, but everyone so far just leaves the ribbon long and ties it. I wanted to do clasps, but I was starting to worry it was impossible! You’re welcome! Please share photos of your belt when it’s done. I’d love to see it! 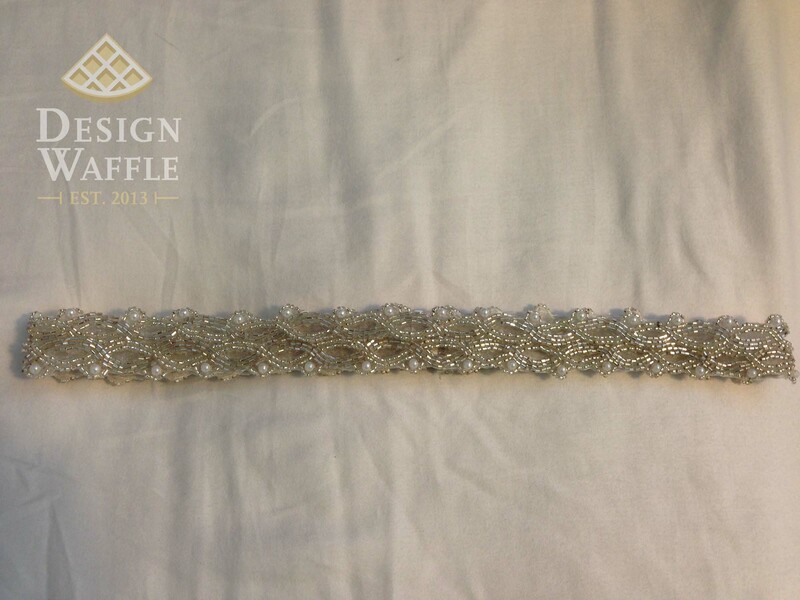 Thanks so much for this – i’ve been struggling with how to make a sash for a while now, and started sewing tiny beads onto lace which was taking forever and just not looking how I hoped! This is much better and easier, i’m off to the shops tomorrow to look for trim! You’re welcome! I hope your project goes well!